A sneak peak of my baby's room. Learn how to make your own floating Pom Pom Flowers at Design Dazzle. K, first of all, love the angle on that pic- totally looks commercial. Love the idea, looks like fun... the stencil on the wall is beautiful, too. We are just NOW getting around to mildly decorating Daniel's room... and he's 16 months old:). I'll show you some pics when we're done, you might appreciate it. I love those pom poms. I used some for a baby shower and just can't part with them. I can't wait to see the finished nursery! Love pink/green together! Have an awesome long holiday weekend! Hi there! I love those pom poms. I'm going to try that one. Love it Anna Rose I see you did scrape off the ends. you are so funny. Love you though. I really like the letter E decal (I am partial to the letter E). I'm sure the baby's room is gorgeous. that E is so sweet! thanks for sharing!! What a lovely, classy nursery! Thanks so much for joining in! what a great peek. It will be fabulous! Thanks for the shout out! Would love to see your nursery - make sure to email me a link! Love it! My little one is three. 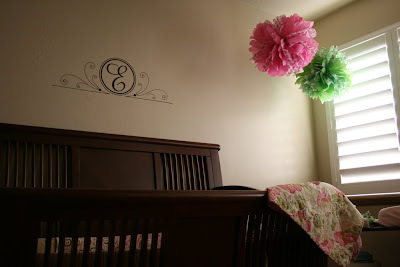 I used pom-poms at her birthday party and they are now in her bedroom. Love them!